Island Bay, Sat. 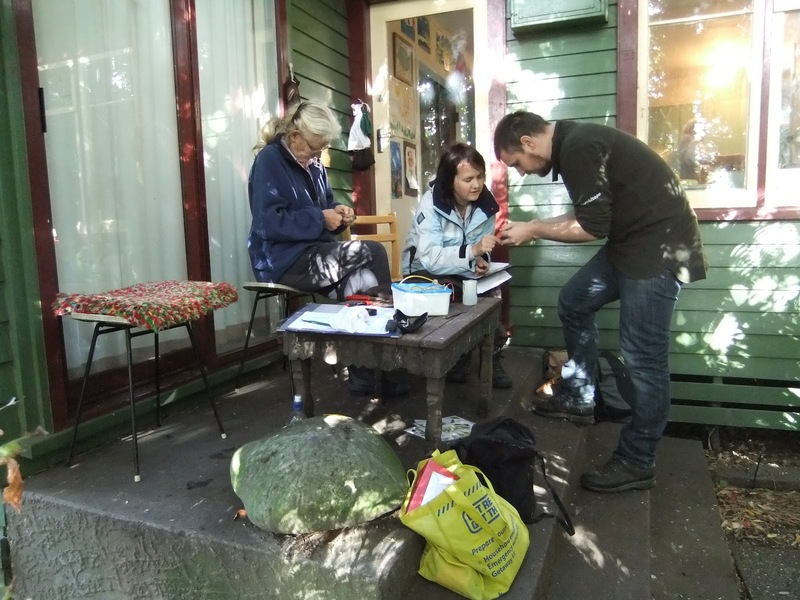 25 Feb.
Annette, Zoe, Tom and I had a successful morning's banding at Island Bay on Saturday, although the tally was very biased towards one species and almost all the birds were juveniles. In all we caught 74 birds of 6 species with 73 new and only 1 recapture. Annette, Zoe & Tom processing more Sparrows. House Sparrow – 58 and 1 recapture, a bird from the last session. Sparrows enjoying some fine dining in Central Wellington. Today was the first time we have used a large number of the new "BP" size bands, initially we found them very strange but after we worked out a good method of putting them on they appear satisfactory. Over the last couple of weeks I have set a funnel trap both here at my place and down the road at Bridie's (about 3oo m) mostly targeting juvenile House Sparrows with some success. In all have caught 61 birds of 5 species with 45 new and 16 recaptures. There appears to have been some very late breeding by both Sparrows and Silvereyes with a number of newly fledged birds caught also had a Silvereye in the trap that was feeding 3 fledglings through the mesh. Took a pretty basic photo from the window. Annette and I had a very quiet time at the Zoo Stream with very few birds about. We ended up with a total of only 6 birds with 1 Fantail, 1 Chaffinch and 3 new Silvereye and a recapture. Not sure why there was such a big drop in numbers from a couple of weeks ago as the conditions were good, just one of the mysteries when dealing with wild birds. Got up early and went up to the fennel patch on Mt Albert to see if there were any Silvereyes feeding there yet. They feed on the ripening seeds and probaly on any aphids etc as well for a couple of hours after first light. Managed to catch 14 new and one recapture (from the Zoo) as well as a bycatch of a banded House Sparrow which was banded a couple of years ago at Martin Lucke Park, about 1 km away. Most years Silvereye numbers build up at this site towards the end of Febuary so will probably have another go in a week or so. We had a successful banding day at the Wellington Zoo on Saturday. We caught 60 birds of 6 species with 51 new and 9 recaptures. Not a very high recapture rate but that is not surprising as most of the new birds were juveniles. After overnight rain the weather was good for banding and there was a very good turn out of banders with an international feel as there were people from the UK, US and Sweden. Erik from Sweden used a few different techniques from us and it was interesting discussing the differences; it is great to exchange ideas. Zoe, her friend Tom and I had a banding session at the Houghton Bay stream on Monday afternoon. Birds were in low numbers and very wary possible due to a cat prowling the area. In all we only caught 18 birds of 3 species with 1 Grey Warbler, 1 Chaffinch and all the rest Silvereyes, 4 of which were recaptures with the oldest banded Feb 08. This is the oldest Silvereye caught at this site. Several of the the birds are well into primary wing moult, heralding the end of breeding and the approach of autumn. Silvereye well into moulting its primaries.